The best kind of mail, from my niece, Tayler. The above picture is of the letter I received this past Monday from my almost 8 year old niece, Tayler. It's the kind of mail that makes your heart smile. It's no secret to my friends and family what a huge Harry Potter fan I am. I've been able to share that love with my 13 year old niece, Ashlee, for the past few years. I bought her the complete series of books, her first chocolate frog and lots of memorabilia from my visits to The Wizarding World of Harry Potter in Orlando. Tayler was always just a little too young, but no more! I was thrilled when I received this letter Monday. I'm going to reread the series, again, along with her. The only thing that could of made this letter better is if it had of been delivered by a owl. 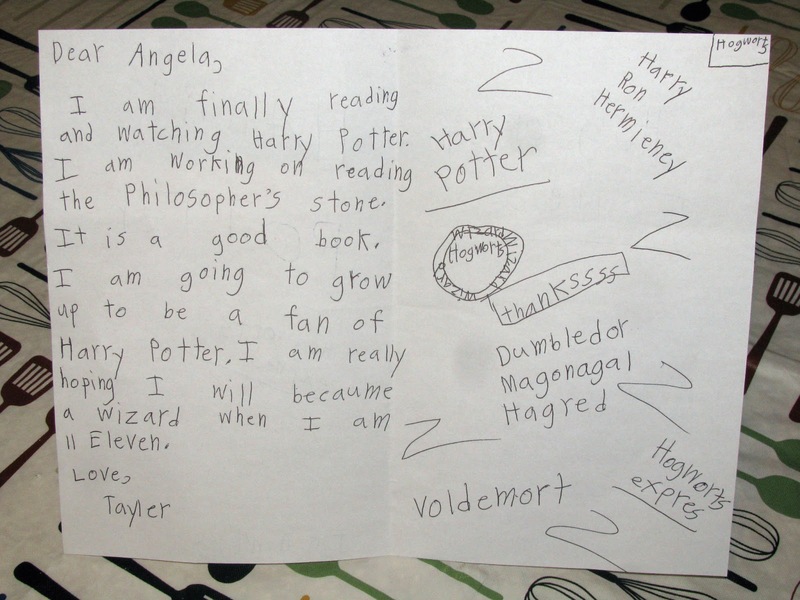 I look forward to rediscovering the magic of Harry Potter with Tayler.